Sheldon: Do you recognize this? Leonard: Not the roommate agreement! Sheldon: Indeed, the roommate agreement. I call your attention to the friendship rider in Appendix C: Future Commitments, Number 37. In the event one friend is ever invited to visit the Large Haldron Collider, now under construction in Switzerland, he shall invite the other friend to accompany him. Leonard: We also put in what happens if one of us gets a MacArthur grant, or if one of us gets super powers, or if one of us turns into a zombie. Sheldon: He can't kill me, even if I turned. Penny: Ts there anything in there if one of you gets a girlfriend? 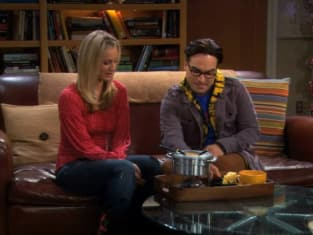 Sheldon: No, that seemed a little far fetched.